and 7 minutes by taxi from Ramkhamhaeng Airport Rail Link Station. Someday @Bangkok provides you with a laid back, friendly, fun, clean, and safe place to stay during your trip to Bangkok. 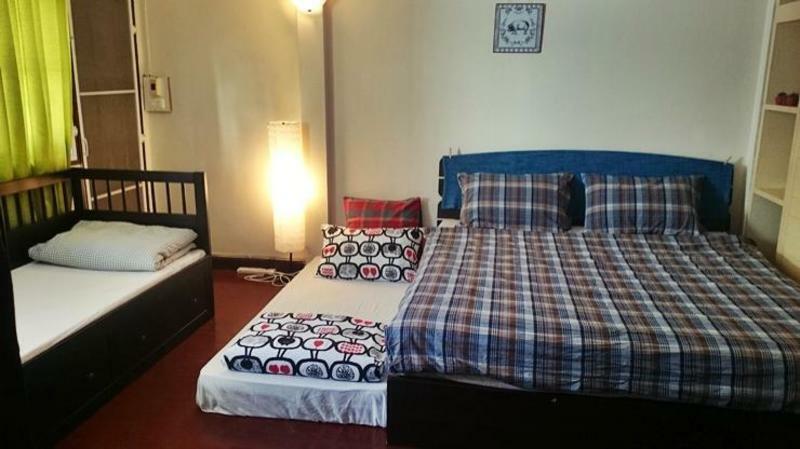 There are 4 room types: 1 double bed and 1 single bed with balcony (private bathroom), Double bed with balcony (shared bathroom), Single bed(shared bathroom), Bunk bed(shared bathroom). There is a living room for guests to relax and kitchen with a microwave and fridge for guests to use. You can get great information about Bangkok ( and all about Thailand, Laos, Cambodia, Vietnam, Malaysia, Singapore, etc) from here. The trip from the airport costs approximately THB 250-300. Remember there is a THB 50 surcharge for travel from the airport and to have cash ready if your driver is planning to use the tollway. The total time is about 35 minutes.